Excellent detail and I like the colouring, but do you know why there is a peripheral darkening? Vignetting? 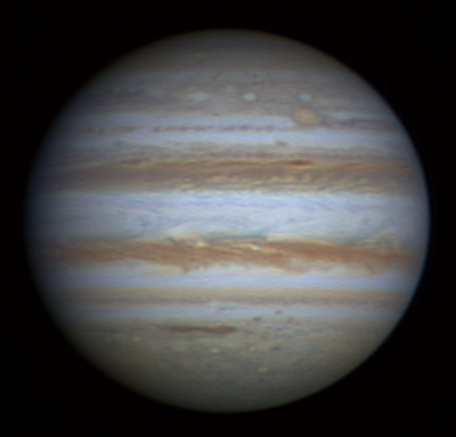 Hi Dave its a combination of the shadow effect as Jupiter approaches earth. And likely some clipping during processing. 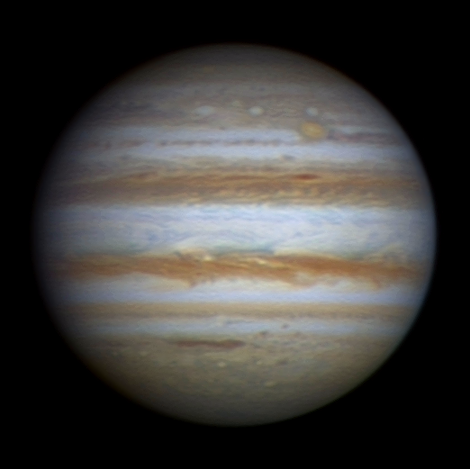 That's the best Jupiter I've seen so far this season, what equipment & processing details were used if you don't mind me asking? I haven't managed to image it yet this season. Hi Tich I did 3 runs of 3 mins each RGB Astronomik type 2 filters At 60 fps 1/60 secs exposure. Then aligned using Winjupos. to counteract the long duration of the captures. Frame count stack for each Channel was roughly about 10.000 frames possibly slightly less. Sometimes I did blue at 1/130th secs exposure. so the frame count stack would have been about 5000 frames. I think I did some at 30 and some at 60 fps on blue. Just experimenting. Stacked on AS/2 drizzle 1.5 then downsized. dyadic wavelets on registax 5 mostly wavelet two. possibly some with wavelet one one in combination with wavelet two. Further processing, Noise reduction, sharpening, colour, and levels adjustments on Image analyser. Would take a age to go into finer detail. But I will say I did increase local contrast. on analyzer, adjusting maximum contrast. and extra contrast. And increasing colour saturation. I check the colour balance on reg 5 auto colour balance. then adjust by eye back on analyser usually a green and blue lift. Slightly more blue, as it is always the weakest signal.